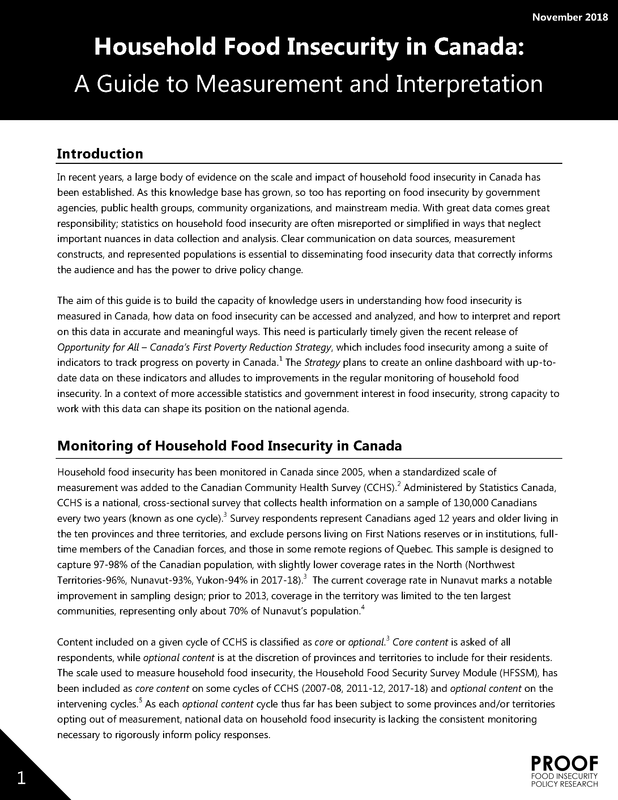 Federal and provincial initiatives such as investments to reduce child poverty, programs to increase labour force participation, and funding of community-based food and nutrition programs to assist vulnerable populations, may directly or indirectly impact household food insecurity, but ameliorating household food insecurity is not the focus of these initiatives and their impact remains under-evaluated. 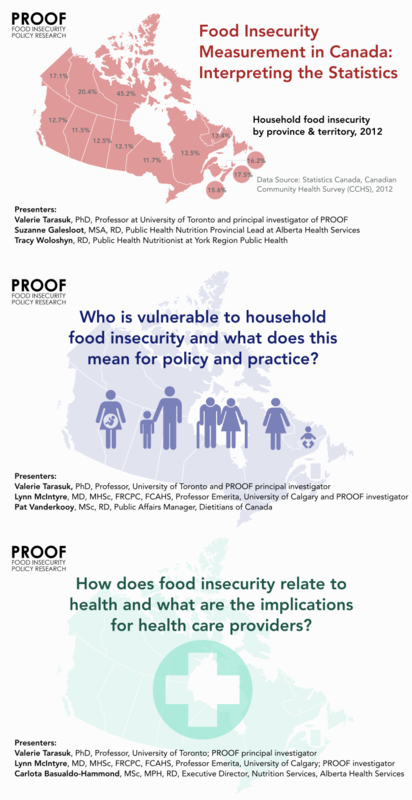 Food insecurity remains a pervasive and serious problem in Canada, and community food programs are the primary response to the problem. When a household is unable to buy the food they need, they may seek out charitable food assistance in the form of food banks (also called grocery or food hamper programs) and meal/snack programs. However, the limitations of these programs in addressing food insecurity are well-documented. The groceries provided by food banks are limited in quantity and sometimes of questionable quality. Research examining meal/snack programs has found that meal provisioning is often a secondary service for an agency, and thus the schedule and timing of the meals are designed to fit within the existing operations and resources, and not the food and nutrition needs of program users. In addition to charitable food assistance, there are a variety of community level food-based and nutrition programs that have broad social goals related to the environment and community- building. However, many also strive to increase access to nutritious foods and local foods among low income groups and are sometimes seen as food security initiatives. These programs include community kitchens, community gardens, food buying clubs, farmers’ markets and food boxes. The limited research on these programs suggests very low participation rates, with little potential to impact food insecure households. Huisken A, Orr SK, Tarasuk, V.
Canadian Journal of Public Health 2017; 107(6), e526-e532. Pettes T, Dachner N, Gaetz S, Tarasuk V.
Journal of Health Care for the Poor and Underserved 2016; 27(3): 1303-15. McIntyre L, Tougas D, Rondeau K, Mah CL. Agriculture and Human Values 2016; 33: 843-859. Tarasuk V, Dachner N, Hamelin AM, Ostry A, Williams P, Bosckei E, Poland B, Raine K.
BMC Public Health 2014; 14: 1234-1244. Roncarolo F, Adam C, Bisset S, Potvin L.
Journal of Community Health 2014; 40(2): 199-207. 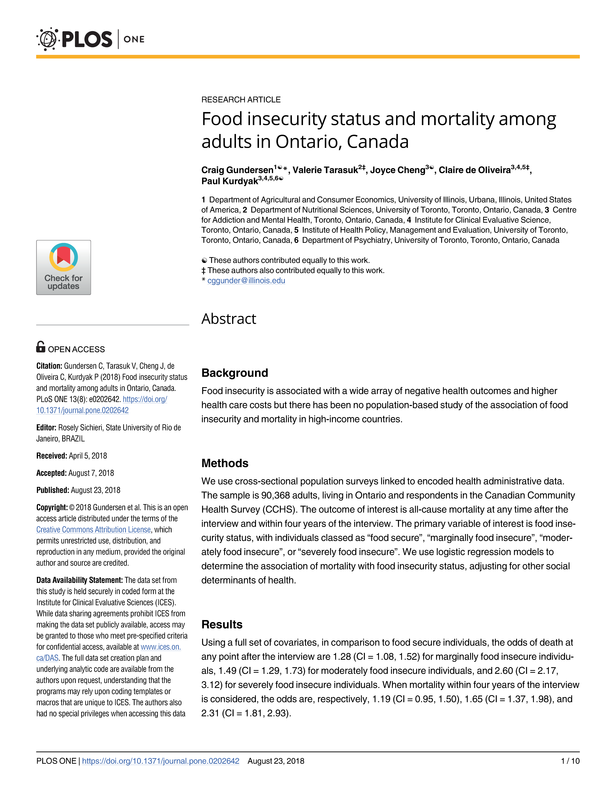 Canadian Journal of Public Health 2013; 104(1): e55-e59. Canadian Public Policy 2012; 38(4): 497-514. Wakefield S, Fleming J, Klassen C, Skinner A. Critical Social Policy 2012; 33(3): 427-450.
International Journal of Consumer Studies 2011; 35: 58-68. Dachner N, Gaetz S, Poland B, Tarasuk V.
Journal of Health Care for the Poor and Underserved 2009; 20(3): 846-853. Canadian Public Policy 2009; 35(4): 433-450. Canadian Journal of Public Health 2009; 100: 135-138. Bocskei E, & Ostry A.
Canadian Journal of Dietetic Practice and Research 2010; 71(1): 46-48. Rock M, McIntyre L, Rondeau K.
Agriculture and Human Values 2008; 26(3): 167-176. Public Health Nutrition 2008; 11(12): 1389-1396. Public Health Nutrition 2008; 11(12): 1296-1305. Irwin JD, Ng VK, Rush TJ, Nguyen C, He M.
Canadian Journal of Public Health 2007; 98(1): 17-20. Canadian Journal of Dietetic Practice and Research 2006; 67(2): 104-107. Collective kitchens in Canada: A review of the literature. Canadian Journal of Dietetic Practice and Research 2005; 66(4): 246-251. Agriculture and Human Values 2005; 22: 177-186. Agriculture and Human Values 2005; 22: 313-325. Williams PL, McIntyre L, Dayle JB, Raine K.
Health Promotion International 2003; 18(2): 163-170. Raine K, McIntyre L, Dayle JB. Critical Public Health. 2003; 13(2): 155-169. Social Science & Medicine 2003; 56: 1505-1515. McIntyre L, Raine K, Dayle JB. Canadian Journal of Dietetic Practice and Research 2001; 62(2): 53-57. Dayle JB, McIntyre L, Raine-Travers KD. Social Science & Medicine 2000; 51: 1783-1793.